Long time lurker and infrequent poster, I love this site and all the great information Carl, Albert, Geo and the rest of the team provide. As a general rule links to images have to end in some image extension like jpg or gif or png… any thing else denotes scripting or a server fed image. Those tend to fail since WP is at the whim of whatever the 3rd party site does and will give up on trying to retrieve the supposed image due to security concerns for the person reading the page. (no logical reason to pass on what could be malicious activity from 3rd party site) With a proper image extension, the WP server knows what it is supposed to receive and if it’s different than what’s expected, it can see that. As JuleP pointed out, a very strong continuous sieismogram signal that lasted for 45 minutes and then slowly faded out. Tremor or passing lahar? 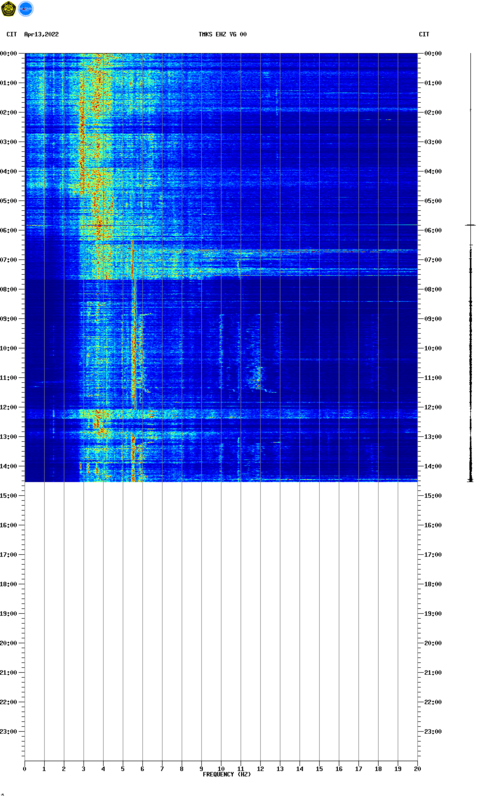 Now seismic signal back to low noise line. The ash emission seems weaker.. I think, It can be lahar/flood, if it passed near the seismic station. 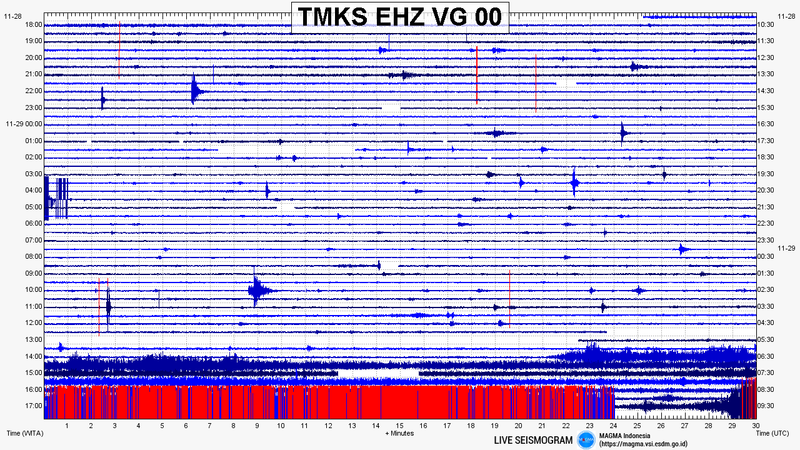 TMKS is the only one of eleven stations around the Agung and we don’t know how it impacts on over seismograms. This tremor is not visible in JAGI seismogram (150 km west of Agung). I remember M2,5 – 3 Agung events shown on Jagi seismogram. I concur. A nearby lahar makes sense. Yes, I think this is also supported by the spectrogram, which is lacking in low frequency content. I think we are in for interesting times in Iceland. If you are a new of infrequent commenter, you may find that your comment does not appear here immediately after it is submitted. What happens is that our protector quarantines such comments, and puts them in a ‘to be approved’ queue. The comment has to wait for an admin, and that may take anywhere from minutes to hours. Once a comment is approved, the protector gets the message and tends to leave future comments alone. We ask for your patience! Apologies for an inappropriate and probably offensive comment the other day. Must have swallowed placebos instead of my common sense pills. That is fine, and thanks for the apology. These things happen. I am happy to accept corrections where errors were made – and typos are rather common in posts that were written late at night and in a hurry! Some more pondering from me. It has been suggested that the night time bukit asah camera is in IR mode rather than low light, i’m not so sure. Looking at the images last night, the glow looked to me to be reflective. If the camera was picking up true incandescent material then i would assume the entire ash column would be glowing, not just the right hand side as seen from that cam? Now watching it in twilight (cloud free hurrah!) to see if there is any colouration apparent in daylight mode before the switch over to night mode. They are moving it around now! Just as i go to look, someone is manually moving the camera about and have just been given a 360 panoramic tour (18.45 their time) – this may be helpful in locating the cams actual position. Bukit Asah as on google earth is actually a very good fit to that 360 degree tour we have just had, unable to spot the actual pylons however. This puts the cam at 19km from the summit and the lights/settlements in the foreground are much further out than i assumed, which is a good thing really. It seems both cameras are now frozen ! There’s a growing danger of me actually getting some work done….. This can’t be a good thing. 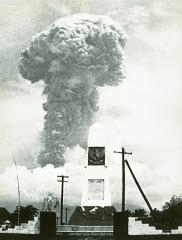 Eruptions come in bursts – lots of activity, followed by days of inactivity, followed by a new burst or by turning off. Just like us, really. Some red colouration was evident in the plume as darkness descended, switch over was at 18.57 and the night cam glow was much more extensive. Still not entirely sure if the glow is reflective or inherent to the plume, from what i’ve seen, especially the red colouration this evening id err towards it being inherent to the plume. It’s possible with there being more than one plume source that there is mixing between hotter (ash) material and cooler (steam) thus an uneven appearance if the camera is recording in IR? The seismic activity this morning local time is confirmed to be quakes. Aka. heavy shaking that made people flee the area. Reported in my native language norwegien based on an article in Bali Express now. The latest BNPB statement said: “Continuing plumes of smoke are occasionally accompanied by explosive eruptions and the sound of weak blasts that can be heard up to 12 km (seven miles) from the peak. I think this report was from yesterday. Things are quieter today and ‘imminent’ may mean next month! Ok, so if I read the translated Indonesian article correctly, the tremor was recorded at 11 different points around the mountain. Then I think it is safe to rule out a lahar local to the one station available to the public. I still wonder about the spectrogram signature. Why is it not showing any lower frequencies? That does not really inspire any confidence that things might settle down. Would i be correct in thinking that tremor like this may caused by fresh magma at depth starting to degas as it rises into the system? I am not convinced this was volcanic tremor. 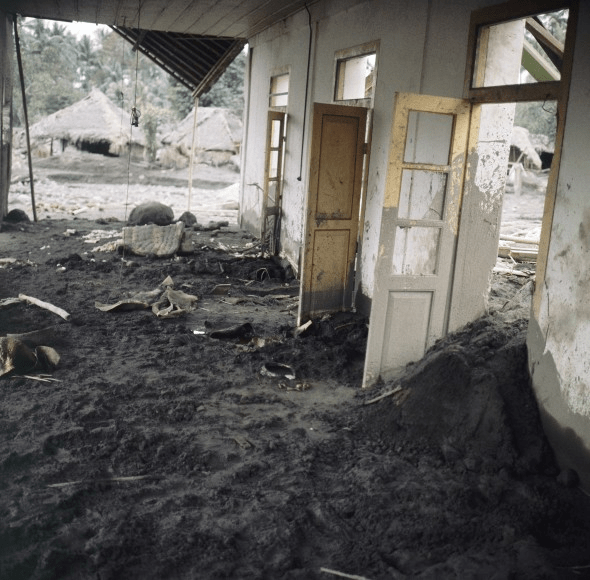 Lahar activity fits the duration and signature, with a slow decline. But let’s see what the official reports say. …..but they failed to hit the spot! Sat in front of the screen it looks like a ghostly face, but stepping a few feet back from the screen then wow, that is a rather unnerving likeness! Last night after neil and macusn mentioned seeing things in the night cam – i promptly saw a dragon head/face, followed by a cartoon style sauropod and eventually a teddy bear. Obviously the night time images are of a friendlier nature. But the picture before was the cookie monster. Pareidolia is a psychological phenomenon in which the mind responds to a stimulus, usually an image or a sound, by perceiving a familiar pattern where none exists (e.g. in random data). Common examples are perceived images of animals, faces, or objects in cloud formations, the Man in the Moon, the Moon rabbit, hidden messages within recorded music played in reverse or at higher- or lower-than-normal speeds, and hearing indistinct voices in random noise such as that produced by air conditioners or fans. It was Lurking that originally posted that image, and for reasons regarding the post about nuclear bombs and Baekdu I found it a good fit for me. With all the scaling changes, assigning an amplitude is a bit “iffy”…but overall the seismic signal appears to be the strongest we’ve seen to date (I think). I don’t think a lahar would result in such a strong signal. I think if THAT was caused by a lahar, it would be of such a scale that we would have heard news of it by now. There is some articles showing some lahar flooding and damage in the area. I have no idea of what this would have caused on a seismograph, but I can imagine on the steep slopes that larger items would be moving. If a lahar or landslide passed by close to the seismometer it could perhaps cause such a signal. 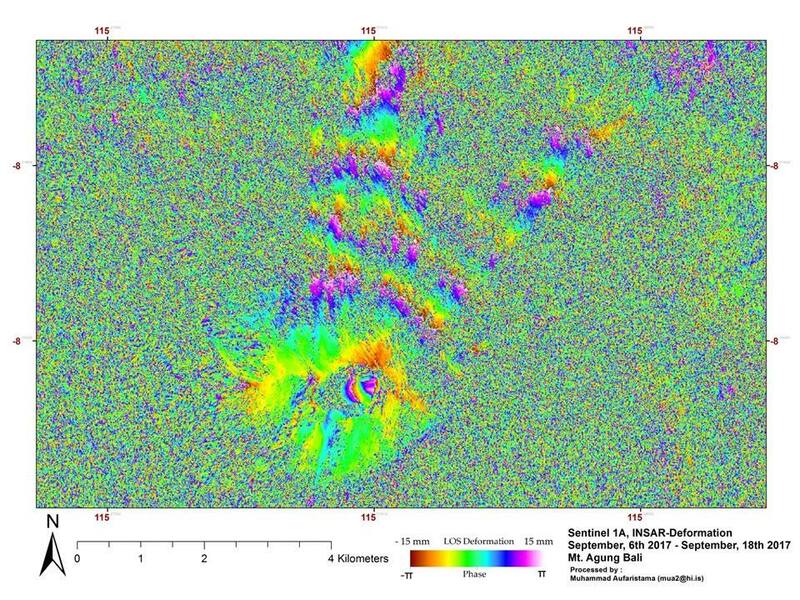 However, If the report stating that many other sensing instruments around the mountain gave similar signal amplitudes, it would be hard to explain it with a lahar/landslide.. Apparently there is a continuous tremor (overscale) that occurred at 13:30 to 14:00 pm. Head of Disaster Mitigation Division of Volcanology and Geological Disaster Mitigation Center I Gede Suantika said during the Gunung Agung crisis, the tremor earthquake happened continuously and this phenomenon was the first time. According to him, conditions that occur indicate Mount Agung entering a critical phase to a larger eruption. 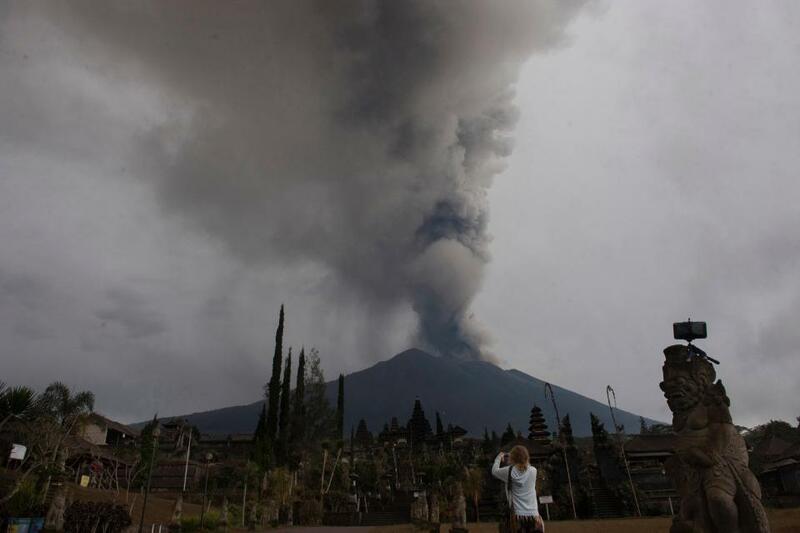 “It has entered a very critical phase for a bigger eruption, as volcanic material is quite large, just this time noting an overscale tremor,” said Suantika. Precisely on the north side of Mount Agung. The rain stones shortly after the overscale tremor . The stone was hot to 500 degrees Celsius. Hotter than the crater lip. Head of Mitigation Division of Volcanology and Geological Hazard Mitigation I Gede Suantika, Tuesday (28/11/2017) explains the throwing of stone that begins shortly after the overscale tremor. “Tremor overscale was indeed followed by a stone throw,” said Suantika. He also added why the direction of throwing occurred in the Kubu region is more due to the crater of Mount Agung is leaning lower on the north side. The Redang Webcam is showing ashfall ATTM. Ash?.. Or rain? Currently rain in the area according to my weather service. I haven’t watched the web cam frequently enough to be able to picture the layout in the dark but that glow in the middle above the electric light – is that lower down the slop or is that from the crater? It fades in and out or possible grows and diminishes. They’ve recently changed the angle of the camera. That, if you mean the one that is just about squarely in the centre of the screen, is the crater. Hear hear – https://twitter.com/CriticalStress_/status/935359594666192896 but to be honest I’m not sure i would limit this view to just “sci stuff”. It will affect the work of a great many people there…and it will affect me. I run a fair trade gift shop. A significant part of my stock is sourced from that part of Bali. A wonderful movie of salt, smoke and dust moving over the Atlantic. Note how the smoke of wildfires in western America end up over Iceland. Thanks for posting! This was really, really cool! Can someone explain what we’re looking at with this? 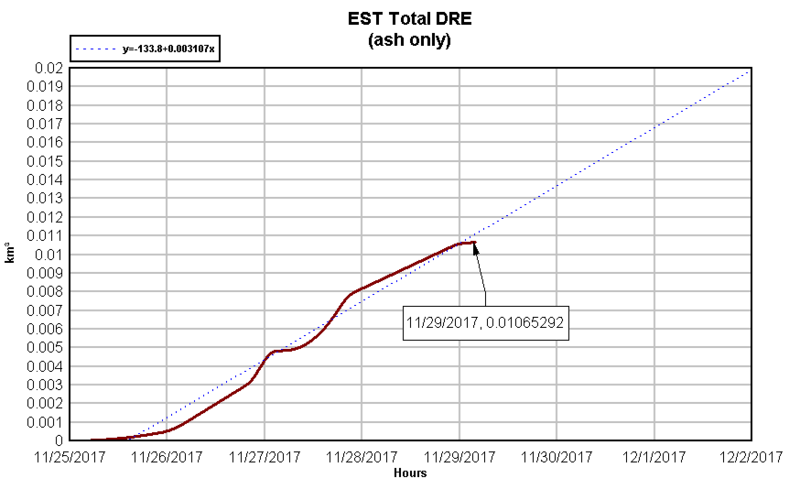 It shows elevation differences between two epochs. The colours together cover 2.8 cm. Where colours repeat, the difference adds up. Going from north of Agung to its summit yo can count 8 blue lines. That means that the summit has inflated by 8*2.8cm which is around 22 cm. For some reason the radar observations east of the summit didn’t give a result. Dense vegetation is a possible cause. They are hard to count and you may well be right! Of course, on the far side of the summit you start counting down again..
Quickly simple estimation based on equation of cone volume and radius 5km. 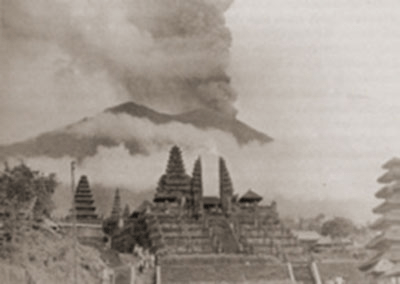 But it is about only 12 days and after the main Agung seismic activity decreased. You are right Albert, that vegetation gives noise. Yes – the pattern in the LIDAR image closely matches apparent density of vegetation as seen from satellite images. How do you tell whether you should count up or count down, since blue is both at +2.8 and -2.8? Activity seems have dropped to very low level for now, only a slight plume from the crater. Have we reached VEI-3 yet? Not official. But by my estimate → 1.0420905 x 107 cubic meters. Yeah I thought it would be borderline. And remember, that’s just my estimate of DRE expended as ash. When the magma gets into the show, my numbers go into the toilet and only serve as an estimate of the lower bounds of what the DRE is officially tallied up to. Even at that, my estimate is a poor guess since I haven’t grabbed data from every single VAAC report. Another source of error is from the fact that Darwin VAAC is not concerned about the accuracy of the height estimate and ALWAYS errs on the side of flight safety. This could lead to overestimating plume height. We are just leaching off the free data to get our volcano fix. I think I am seeing some orange/red tint to the clouds closest to the rim. What worries me is that Agung still shows continuing inflation despite the significant venting in the last few days. Some volcanologists who are there say the decreasing activity is not a good sign. If you have yet to see this picture of a “dirty storm” (lighting on an erupting volcano) you will have to check this out. It is a 10 min exposure of Volcán Calbuco in Chile. Check out the star trails on the right side of the photo! The aircraft ash warning zone has shifted as the wind has moved more to the NE, now – and for the forecast up to 18 hours – the airport at Denpasar is clear. According to some reports I’ve read, over 100,000 people are stuck in Bali due to travel disruption. But even if the air above Denpasar is clear, I don’t know how they can work it. Presumably there will be a shortage of inbound tourists – and I’m not sure if airlines will be wanting to take the risk to fly empty aircraft in to evacuate tourists, with risk the planes could be stuck on the ground if the weather changes and/or the eruption intensifies. It seems like a logistic nightmare – let alone what insurer’s attitudes will be. Interesting, the airport was supposed to stay closed, but all the tourists that said they were going anyway, are VERY unhappy, and lots of kids there on school break, wonder if the teenagers are leaving first? It’s going to Lombok, Good Night all. Yes – looks like a change of plan – the plane’s transponder is back in range of flightradar – looks like it’s headed to Lombok – it may have been headed there anyway but flightradar had Denpasar as the destination based on flight number. The airport was supposed to have been closed. Some of the kids there on a school break are what the Aussies call “schoolies” – kids who have finished the end of last year of high-school, and traditionally spend time getting as drunk and obnoxious as possible – as a rite of passage into adulthood, apparently. Oh wait – not it isn’t – it flew straight over Lombok at 38,000 feet, heading NE to goodness knows where. But impressive for throat clearing. Also, much less visibillity distance. Ashfall closing in? There’s been another burst of strong (presumably) volcanic tremor over the past hour. Not a lot visible on the webcams – except cloud. Looks like the same harmonic tremor as yesterday has started/continued at almost the exact same time. Perhaps this is linked to precipitation during the morning/early afternoon as the clouds roll in? With the tropical storm nearby the rainfall amounts might not be so small, and could possibly help trigger steam eruptions/volatility within the crater? Seems too coincidental in timing and period to be random… but I am probably wrong! There were reports in the local paper that the episode last night coincided with fist-sized rocks falling on a village about 4km north of the crater, so I think it’s only coincidence that another strong tremor is showing approx 24 hours later. I know it’s a significant distance away, but the camera at Rendang is showing little or no wind. Seems to be frozen at the mo. Link here for two cams that seem to be outside both the ash fall and rain storm zone at least, but still a lot of cloud about. Bukit Asah cam working again. Still very murky, although it has lifted a little. Clearly raining, with ash in the rain. It is in stop and go modus abruptly – or is it shaken by wind? I was assuming it was wind but the seismo has been off scale for the past ten min. Hi, just found my password. Pardon, just checking in on you and Bali and I should land in the neither regions? nether in the neither… Oops. Thought my mail would go to the dungeon first, giving you a chance to delete it. Did not want to irritate all with my testing. Had a question, but now it has embarrassed itself into thin air. Will be a good hen now until the question resurfaces. 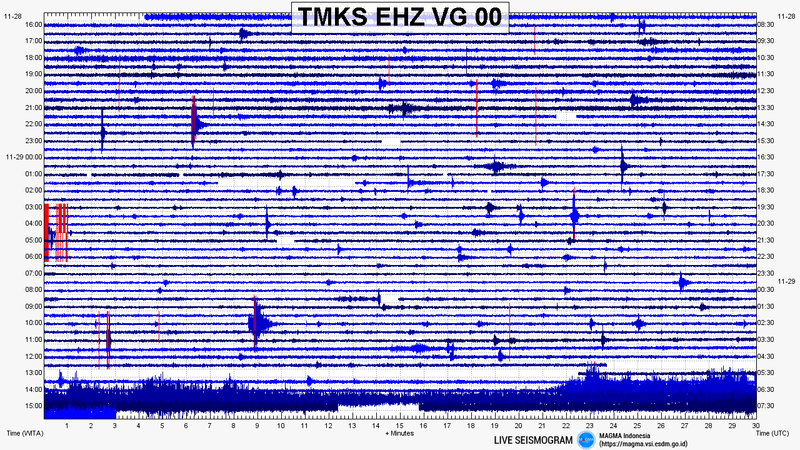 The Bukit Asah cam, and the mast that it seems attache to has been shaking for several hours and it is not more severe than before the onset of high amplitude drum signal. Not clear what causes this shaking. Bali tribune newpaper published today an article on yesterday seismic event. Google translate of the text makes me understand that yesterday reports on volcanic lava-bombs/stones shot from Agung are not true or could not be verified… So, it will be exciting to se what reports that comes out of this seismic event. That camera is zoomed quite a way in to the volcano. It seems to be susceptible to wind movement. Drumplot line shown on some live streams (youtube) suggests that high amplitude tremor is coming and going the last hours. Interesting, Exciting, SCARY!! Let us hope the evacuations were effective and enough extended! Thanks Pyter, This report suggests that the water rich matherial is already mostly lost and cannot cool down the lava anymore. Wonder if the next level will be a slow spill over or if it will go explosive? some glow showing in the clouds at 19:35. More to the right of where we have been seeing it. Could be due to the shift in the winds. This is me writing a very long sentence to test if it is linebreaks or return strokes that causes the boonfangled problem of wordpress and Edge, so let us what is happening now without a return stroke. Confirmation on return key strokes being the problem. Don’t use return key strokes when using Edge and you should be fine. We will have mighty long paragraphs for a while the WP techs fix the problem. Not very is seen on this seismometer about 150 km away suggesting that the high amplitude activity on Agung may be very close to the seismometer and perhaps not as strong and dramatic as we tend to think. Problems with seismograph equipment for me. seems they have made a new setting at around 2125. Low frequency signal is now up strongly compared to before. Could mean moving magma. ( Śóḿéóńé´from the expert group need to comment on this guess). I think the scaling changes every single row, so that the maximum amplitude is always red. 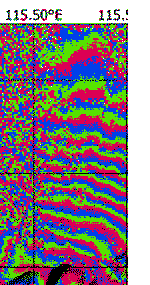 In my opinion this makes the spectrogram very hard to read. Low frequency tremor almost disappeared during the continuous tremor at 14:30 – 18:30. Looks like they were tweeking the gain throughout the episode, IMHO. A bit of “trial and error” perhaps? Face, palm: http://www.independent.co.uk/news/science/volcano-super-eruption-apocalypse-wipe-out-life-human-kind-timeline-how-long-a8082006.html . Dear, oh dear, oh dear. The only thing “like” about that stuper eruption and Mt Agung is that they are both volcanic features on a rocky planet near a small yellow star. It’s like Katla being similar to Mt Ranier. Both have ice on top. Fierce looking glow in the crater now. Thanks Ian for updated map. Iceland boils on! Will be an exciting 2018! Nasa say Agung could plunge earth into an Ice Age. Not what the article actually says?? Clickbait methinks..
A VEI 6 eruption is at least needed to have any significant effects on global temperature. I doubt if Gunung Agung is able to do this. Is Lava flowing down the Volcano now? Something seems to be heading towards the lights I just hope this area has been evacuated. Hopefully this may only be clouds ?